Which Lamp is Best for home and Salon? If UV gel nails aren’t properly cured, the results could range from lifting, cracking, air pockets ,to allergic reactions and more. To ensure proper curing of UV nail gels, its very important to always use the UV or Led nail lamp that was designed specifically for the UV and Led gel polish brand and which has been recommended by the manufacturer and cured as directed. Gel Polish is cured by UV light within minutes. Your nails are completely dry by the time your manicure is over, and strong enough to withstand everyday wear like housework and outdoor activities such as gardening and sport. It offers long lasting wear. and features similar to a plasticised coating. What if I am not a Nail Tech, can I apply Gel Polish at home? It takes little practice to apply your own Gel Nails, you should follow the instruction provided and check out our troubl shooting Q & A below. It's fun, inexpensive and virtually anyone can do it! Color: The cost of the polish is about $9.75 per bottle. Curing lamp: Gel polish cures under an LED or UV lamp, it wont work without one of these. Curing Lamps on our website range from $40 - $145 Click here to find out which lamp is best for you. Starter Kits have been designed and packaged with everything you need to get started! Generally Led lamps will take less time to cure the gel polish, however a small wattage Led such as a 9 watt Led will still take 2 minutes cuing time, so stick with powerful Led higher wattage such as a 48 watt Led for maximum results. If you are budget conscience, then look for lower watts such as an 18 watt led. - or go with the traditional UV 36 watt UV Lamp. Unlike UV curing lamps, Led light globes never require a change of light bulbs. UV curing lamps are standard throughout retail salons and are very effective. After some time of regular use, the light globe bulbs in UV lamp may no longer cure the nail gel products properly. You can purchase UV light bulbs here, the 36 watt UV lamp consist of 4 x 9 watt UV bulbs. Generally, in around 2-4 months of regular Salon use, or much longer for home usage. Can I purchase just any lamp? 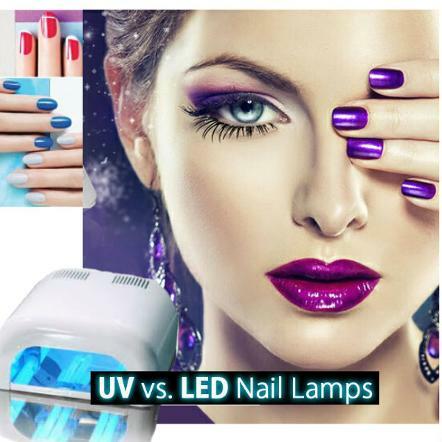 We have found that the lamps found in our store will cure many brands of Gel Nail Polish, because many brands of Gel polish will cure under a 36 watt UV lamp or a 48 watt full Led lamp. Salons generally have both of these lamps in their salon as they work with many and most gel polish brands. Some UV brands will cure under both UV and Led light, and some LED Gels will only cure under Led light. Again, check with the brand manufacturer if you are unsure. Gel Polish, UV Gels, Builder Gels or Creative Nail Design SHELLAC® Nail Color at home may not cure properly in just any LED lamp, because they can produce different wavelengths of light. Some brands/color of Gel Polish is formulated to work with specific wavelengths which is why brand manufacturers often sell their own lamps. Creative Nail Design, the manufacturer of SHELLAC ® Nail Color recommends using its own CND™ brand LED curing lamp to cure SHELLAC® Nail Color. Gelish also have their own 3G Led curing lamp produced especially for their brand. Recommended for Salon is the 48 watt LED or 36 watt UV curing lamp should be used.